Every year we celebrate the young artists in our community by equipping them with inspiration, mentorship, and tools. The festival is a multi-track, multi-level theatre arts emporium for students from ages 5 - 18. We’d love for your kiddos to join! The Spring Break Youth Theatre Camp is a high energy, theatre-centered immersive arts program for middle and high-school students ages 13-17 who demonstrate a concentrated interest in the performance arts. The program will cover many of major facets of theatre production. The best part of this camp will include the opportunity to work with Steven Sapp & Mildred Sapp of Universes, along with many other talented artist in the industry. We will discover Dancing , Stage Management, Tech Design, Directing and Musical Directing in our 4 sessions. If you child attends 3 of the 4 they will receive two tickets to the upcoming show SWOPERA. Register for more details. In the summer of 1919, Great War veterans returned home. Tempers flared as African Americans and white veterans vied for scarce jobs in cities across America. Known as the Red Summer, racial conflict erupted and many lives were lost. In Knoxville, the death toll remains a mystery. One man, Maurice Mays, stood at the center of the Knoxville Riots in which the National Guard was summoned. One of the darkest periods in Knoxville history, the Red Summer still has much to teach us. What is the answer to racial hatred? What is the cure? The Carpetbag Theatre Inc. along with members of hip-hop collective, Good Guy Collective, and puppetry and theatre group, Cattywampus Puppet Council, will be facilitating a Story Circle to help gather stories for a collaborative theatre piece they will be writing this winter and performing in fall of 2019. Homegrown Fellows is a high energy, theatre-centered immersive arts program for high-school students who demonstrate a concentrated interest in the performance arts. The program will cover all major facets of theatre production including playwriting, acting, directing, production, technical direction, stage design, lighting design, marketing, and fund sourcing. We are pleased to announce that we will be presenting at the 2018 International Black Theatre Summit this year. The 2018 International Black Theatre Summit, “Breaking New Ground Where We Stand,” will be held at Dartmouth College in Hanover, NH September 26-29, 2018. The summit is a reconvening and celebration of legendary playwright, August Wilson’s 1998 “On Golden Pond” black theatre summit which originally convened at Dartmouth to assess the state of black theatre funding, resources and opportunities. Due to various creative and business intersections throughout the entertainment industry, the 2018 reconvening will include entertainment industry insiders and scholar-artist practitioners in theatre, film, television and media. Our goal is to maintain and establish more intentional strategies and professional networks, programs and coalitions that capitalize on the links between theatre, film, television and related media platforms with domestic and international connections. The network will better support and sustain black artists, cultural producers and audiences thereby providing models for cross-cultural collaborations. The Carpetbag Theatre, Inc. presents, “Ce Nitram Sacul”, a play about a woman in crisis. Disturbed by the violence and insensitivity around her, she turns to her “Womantor”, her ancestral touchstone of advice. The unusual circumstance is that her Womantor has been dead for more than twelve years. Carpetbag Theatre's Executive and Artistic Director, Linda Parris-Bailey, will be presenting at this years National Institute for Directing & Ensemble Creation. She will be accompanied by Carpetbag's Executive Support Manager, Jonathan Clark. Carpetbag Theatre takes Between a Ballad and a Blues to Nashville for the 2018 Tennessee Arts Academy. Between a Ballad and a Blues chronicles the life and work of the African-American-Appalachian Renaissance man Howard “Louie Bluie” Armstrong and his musical partners, Ted Bogan and Carl Martin. Together, the three men formed one of the most famous string-band groups in the history of American music. As a group and as solo artists, Armstrong, Bogan, and Martin toured the globe sharing string band music with the world and planting the seeds for other American music forms—including country and blues. The play centers on the character of Howard Armstrong and spans his seven-decade musical career. Armstrong narrates the tale, which is augmented with stories and songs from Bogan and Martin. The excerpt that will be performed during TAA is designed for young audiences and features Bert Tanner as Armstrong, music by Sean McCullough, and stories by the playwright Linda Parris-Bailey. The conference will bring together arts administrators, educators and artists for a full two days of learning and sharing around the theme of Design Thinking, an approach that can be used in all industries to consider and resolve a variety of issues. Professional development will include best practices, strategies in arts management and education, lesson demonstrations, collaborative work, networking and more. The Appalachian Puppet Pageant is a giant puppet community arts parade, bringing together community members of all ages and backgrounds to celebrate and share their stories through the visual and performing arts. Through this event, we hope to provide an opportunity for community members who have experienced urban renewal to share their stories with the wider community. The Carpetbag Theatre Inc.'s production of Dark Cowgirls and Prairie Queens is the story of a little known facet of American History. Filled with vivid images, captivating stories and harmonious song, "Cowgirls" brings to life seven of the most colorful Black women to emerge from the American West. The play, written by CBT's Executive/Artistic Director Lina Parris-Bailey is an imaginative dramatization of the lives of: Mary Fields (affectionately known as Black Mary), Biddy Mason (Grandma Mason), sculptress Edmonia Lewis (Little Wildfire), Mary Ellen Pleasant (Mammy Pleasant) of underground railroad fame, and Julia Boulette (fondly remembered as the Queen of Virgina City). Come and join the Carpetbag Theatre as we celebrate the Grand Opening of our Parris Bennett Digital Storytelling House. The Carpetbag Theatre, Inc. has gathered, preserved and performed community stories nationally and internationally. Over 10 years ago, Linda wanted to expand our methodology for gathering and preserving community stories, so she took several ensemble members to be CBT's first digital storytelling trainers. Linda Parris-Bailey will be a returning faculty member for the National Institute for Directing and Ensemble Creation to be held in Minneapolis, MN. The National Institute for Directing and Ensemble Creation was conceived in response to the dearth of professional opportunities for directors in the U.S., particularly directors of color and women, and to the lack of in-depth ensemble training in various forms for future aesthetics. As a recognized leader in the field, Linda will give a perspective of African American directing and ensemble practices that are often overlooked when discussing the history and methods of ensemble creation and directing. Carpetbag Theater's Executive/Artistic Director Linda Parris-Bailey will represent CBT at the Network of Ensemble Theater's National Gathering and Symposium Past Forward. A champion of ensemble theater and a leader in the field, she will co-facilitate a plenary about the history and legacy of the ensemble movement and history of the Network of Ensemble Theaters. The Carpetbag Theatre Inc. Presents: Youth Theatre Festival 2017, a festival of young people performing for young people, with the hopes that they will be inspired to know that they can do it too. The festival will feature performances and classes from Knoxville's brightest youth artists. Registration will begin at 9:00 AM with performances and workshops lasting from 10:00 AM until 3:00 PM. The event is free, and if you would like your youth group to attend, please call and reserve your space by calling 865-544-0447. The Carpetbag Theatre Inc. Presets: Cultural Odyssey's Fully Awake & Facing Seventy: Heaven Betta Bea Honky Tonk! The Carpetbag Theatre Inc. Presents: Cultural Odyssey's Fully Awake & Facing Seventy: Heaven Betta Bea Honky Tonk! May 19 and 21 7:30 PM at the Beck Cultural Exchange Center. Tickets are $20 and can be purchased by visiting KnoxTix.com. “FULLY AWAKE & FACING SEVENTY: HEAVEN BETTA BEA HONKY TONK!” is written and performed by RHODESSA JONES with musical direction and performance by IDRIS ACKAMOOR. It is an evening of cabaret with live music celebrating Rhodessa Jones becoming an official senior citizen. FULLY AWAKE poses the question, “Can the artist look back at her life as a way of ‘seeing’ into the future?” It is also a treatise on the Baby Boom Generation confronting their last years with panache, style, humor and yoga! Rhodessa confronts the issue of aging “full on” with insight, a sense of progressive politics, banter, pathos, empathy and sharp-edged humor addressing the issue of growing old with dignity and security. 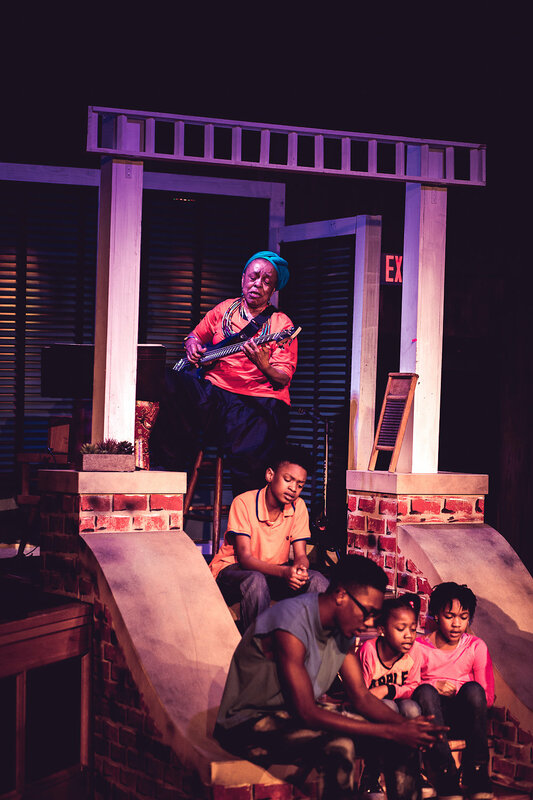 FULLY AWAKE is for audiences of all ages since in one-way or another since “we are all FACING SEVENTY!” FULLY AWAKE completes a trio of full-length solo autobiographical works of Ms. Jones’ almost half-century career as a professional artist and community activist. Based in San Francisco, California, Cultural Odyssey's mission is to support the artistic work and vision of Rhodessa Jones and Idris Ackamoor, as well as an ancillary group of emerging and established performing artists. To implement its mission, Cultural Odyssey locally premieres the original productions of Jones & Ackamoor, presents the Cultural Odyssey Performance Series, offers free and low cost technical assistance to artists and small arts organizations, and conducts residencies and national and international tours. As well, it operates a community-based program entitled, The Medea Project: Theater for Incarcerated Women that serves female inmates, ex-inmates, HIV positive women, and female community participants. In addition, the company conducts jazz programming spearheaded by Idris Ackamoor & THE PYRAMIDS and the Music is the Healing Force of the Universe Community Orchestra. Cultural Odyssey was founded by Idris Ackamoor, Executive/Co-Artistic Director, in 1979 and joined by Rhodessa Jones, Co-Artistic Director, in 1983. Idris founded Cultural Odyssey after traveling to Africa and observing the interdisciplinary nature of African artistic culture. Also of note was the connection African artists had with their community. His early vision was to found an organization that combined music, theater and dance into a unified whole that was responsive and influential to the needs of the community. Idris Ackamoor and Rhodessa Jones have developed a variety of original productions that demonstrate their vision of "Art as Social Activism." They have collaborated with nationally renowned artists such as choreographer Bill T. Jones, the late artist Keith Haring, writers Pearl Cleage, Ntozake Shange, and Eve Ensler, and tenor saxophonists Chico Freeman. Having toured in the United States, Africa, Japan, the Caribbean, and Europe regularly for thirty five years, Cultural Odyssey also continues to establish strong artistic roots and community involvement in San Francisco by showcasing their productions. The Carpetbag Theatre Inc. Presents: Cultural Odyssey's “FULLY AWAKE & FACING SEVENTY: HEAVEN BETTA BEA HONKY TONK! The Carpetbag Theatre, Inc. will participate in Art in the Service of Understanding convened by the New England Foundation for the Arts. This conference will bring together key stake holders to assess the impact of creativity to build bridges between the military and civilian experiences and improve well-being for individuals and community. This convening will bring together artists, researchers, healthcare experts, military personnel, and policy leaders to discuss best practices, lessons learned, and share information. The Speed Killed My Cousin will be in residence at Working Narratives in Wilmington, North Carolina. More information will be forthcoming. Speed Killed My Cousin is the story of a young African-American female veteran of the Iraq war and her struggle with "Moral Injury", Post Traumatic Stress Disorder (PTSD) and Military Sexual Trauma (MST). A third generation soldier, the central character courts death by vehicular suicide. The Carpetbag Theatre, Inc. 50th Anniversary Series is a six part series remounting the original works of The Carpetbag Theatre as fully produced performances at local Knoxville and Maryville venues. The performances, made possible by generous support from The Roy Cockrum Foundation, will take place over the course of the three years leading up to the company's 50th Anniversary Celebration (2017, 2018, 2019) with two productions per year. CBT will invite former ensemle members who have remained in the professional field to return as guest artists and directors of the project. You can purchase tickets at the Clayton Center Box Office. The Carpetbag Theatre, Inc. 50th Anniversary Celebration Series is a six part series remounting the original works of The Carpetbag Theatre as fully produced performances at local Knoxville and Maryville venues. The performances, made possible by generous support from The Roy Cockrum Foundation, will take place over the course of the three years leading up to the company's 50th Anniversary Celebration (2017, 2018, 2019) with two productions per year. CBT will invite former ensemle members who have remained in the professional field to return as guest artists and directors of the project. You can purchase tickets at the Clayton Center Box Office.